Looking for more? 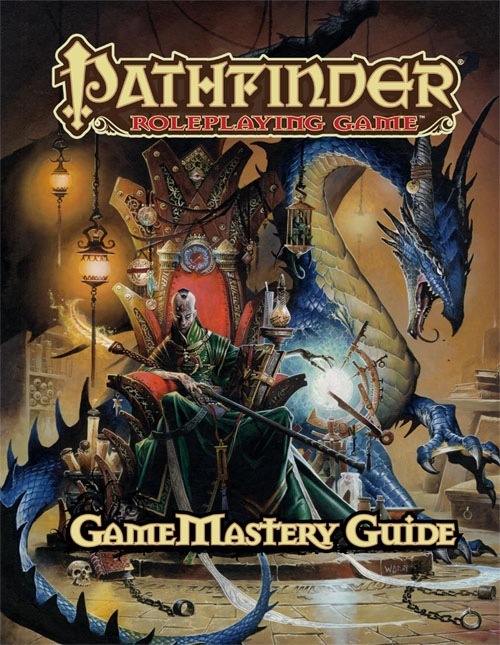 Check out the Resources and Free Downloads available for the Pathfinder Roleplaying Game. 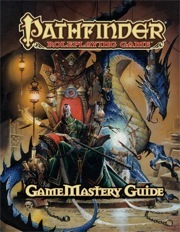 Published back in 2009, the GameMastery Guide was one of the early hardcover books released for Pathfinder. I think it's an overlooked gem, as I crack it open before and during sessions as often as any book other than the Core Rulebook. Weighing in at a hefty 320 pages, the GameMastery Guide has advice on the usual topics that new GMs need help with, but it also contains so much more, like little new rules subsystems, a gallery of pre-made NPCs, all sorts of random tables, tracking sheets, etc. It's a very handy compilation of material specifically designed for Pathfinder, and I'd recommend it as an early purchase for any GM getting into the game. We have to start with a shout-out to that awesome cover, featuring Runelord Karzoug seated on his throne. I'm partial, since I'm running a certain AP at the moment, but artist Wayne Reynolds knocked it out of the park there. There's no way the interior artwork could be as good, and it's true that many of the interstitial drawings are recycled from other products or are forgettable placeholders. However, the artwork accompanying the NPC gallery is solid and fits the feel of Golarion. If I were using letter ratings, the cover art would get an A+ and the interior art and layout would get a C+. The book is divided into 9 chapters, with multiple appendices and indices. Chapter 1, "Getting Started", is stuff that experienced GMs will have seen a thousand times before, but that new GMs will appreciate. It covers stuff like a gaming glossary, how to deal with sensitive topics, how to find players and set aside a place to play, developing house rules, etc. It's standard advice, and if I had to quibble with anything it's that the section is so focussed on catering to players' desires that it leaves out a crucial consideration: the GM needs to have fun too! I did like the idea of creating a custom player's guide before each new campaign, and that's something I'll probably do in the future. Chapter 2, "Running the Game", talks about preparation, presentation (music, handouts, lighting, etc. ), building encounters and adventures, and how to handle in-game problems (PCs missing a clue, getting too much treasure, etc.). Again, it's all solid advice (though I don't agree with customising encounters for PC abilities, as that holds the risk of undermining the very advantages they've worked to gain). I think the best bit in the chapter is the "Game Changers" section, with talks about how to handle problems specific to Pathfinder: spells involving invisibility, teleportation, lie/evil detection, flying, auguries, and more. These spells can dramatically change the game and wreck certain types of plots if a GM isn't careful. The section ends with some good tables: fifty different adventure plots, twenty plot twists, and a bunch of macguffins. Good material if you're creating your own adventures and get stuck in the brainstorming. Chapter 3, "Player Characters," talks about handling metagaming, introducing new players into the game, handling treasure and character death, whether to allow evil PCs, and different types of common players like the "One-Trick Pony" and the "Rules Lawyer". It's a good and useful discussion, as experienced GMs will encounter these various player types sooner or later and knowing what to look out for and handle them is important if groups are going to persist in the long-run. I think what the chapter is missing is the frank advice that some players just aren't right for some groups, some groups are dysfunctional and need to disband, and that the GM (unfortunately) often has to make the hard calls. It's a responsibility that goes beyond preparing and running adventures, since real people, real relationships, and real emotions can be involved. I'd rank the chapter as average. Chapter 4, "Nonplayer Characters," goes into the basics of giving NPCs personalities and roles in the game. I especially liked the section on traps a GM needs to avoid when running NPCs (such as making them too intrusive, too decisive, too good at combat, etc.). The section introduces a new concept of "NPC Boons," which are special little plot or mechanical advantages that NPCs of different types can give to PCs. We'll see this concept more in the NPC Gallery at the end of the book, but the idea would be that, for example, befriending a local tracker would give the PCs a +2 on Survival checks in the area for one month, or that buying a drink for a down-on-his-luck nobleman could result in a primer on local politics and a +2 bonus on Knowledge (nobility) in the city. Etc. It's a nice way to quantify and reward PCs for good role-playing and encourage those players who are only in it for the bottom line to have more patience with what may at first seem like irrelevant asides. After some fairly mundane advice on villains, the chapter concludes with a great collection of tables: NPC backgrounds, goals, physical characteristics, personality characteristics (some of these are hilarious and memorable, and I wish players were as creative! ), occupations, secrets and rewards, and even the surely-delightful "Random Adventuring Party Name Generator". If you want to be cool, join the "Reputable Pearly Kraken Monster-Slayers in the Shadow of Angels"! Chapter 5, "Rewards," contains an insightful discussion of why rewards manner and the different ways they can be conceptualised and allocated. It goes through the difference between steady small rewards versus occasional big ones, intrinsic vs. extrinsic rewards, and how different players value different things (e.g., is it all about the gold, or is getting on a first-name basis with the barmaid better?). It even gets into little details, such as exactly when XP can be awarded (I forget that some groups do it after every single encounter, while others only do it during true in-game downtime). There's some good advice on how to handle spell research and magic item crafting that makes it clear the whole process needs to be treated more as an art than a mechanical formula. This chapter has a *lot* of random item and random magic item tables, which is really useful when you need to see what a little shop in a small town happens to have in stock, or what that NPC wizard you weren't expecting the PCs to rob from has in his satchel. Chapter 6, "Creating a World," is for GMs who do something I've never really done in Pathfinder (though I have in science fiction settings): create a brand new campaign setting. It has a nice process of answering a set list of questions to gradually firm up the details of the new world and to simplify (to some degree) the difficulty of conceptualising everything all at once. The geography advice is probably over-ambitious, but the concepts are explained really well. The chapter goes through different types of societies and different technological levels. It's not a chapter I'll use, but it's very good for homebrew GMs. Chapter 7, "Adventures," has tips for running stories in different environments (dungeons, the wilderness, etc.). It has particularly good advice on dungeons, with a useful key to map symbols that I should use more often. Again, there's a ton of great tables to stimulate creativity, including random tables on where dungeons can be found, what type they are, what's in different rooms, and several random monster encounter tables (which I wouldn't actually roll on, as they have the common problem of spreading CRs from as low as 1 to as high as 13 in the same table!). The chapter has a section on planes and planar traits, which is an important reference for later products that make specific use of the mechanics presented here. Similarly, it has a section on stat blocks for settlements (used in most Pathfinder products) that is quite important in determining what's for sale in a community, the highest-level of spellcaster available, etc. I use the settlement rules a lot, and although I think they're sometimes a bit cumbersome in play, they're important in making sure that a hamlet "acts" differently than a metropolis. This chapter is packed with a lot of other material, including a two-page rules-set for ship combat (it seems worth trying), lots of random tables for ships and sailors, and, one of my favourite things, random tables for tavern names and unique traits. There's a lot here that I'm going to photocopy and keep with my GM screen to help me quickly come up with more flavourful interludes when I'm running games. Chapter 8, "Advanced Topics," introduces several new little rules sub-systems: chases (elegant, but not completely satisfying), natural disasters, drugs and addiction (happens too quickly and needs a slower progression of effects), fortune-telling (too general), gambling (done well), haunts (one of the best innovations of Pathfinder, great for story-telling), hazards (mostly supernatural ones, but very clever), and sanity/madness (too simplistic, but not bad for just 2 pages). Some of these sub-systems, like chases and haunts, are seen in a lot of other Paizo products, so having the rules on how to run them is really useful. Other topics touched on in this chapter have been developed in far more detail elsewhere, and may be of more limited usefulness. Still, there's enough of enduring value to make the material here worth reading. Chapter 9, "NPC Gallery", is one of those things every Pathfinder GM needs: full stats (and even pictures and descriptions) for NPCs encountered on short notice: bandits to spice up overland travel, city guards for when the "Chaotic Stupid" PC gets too obnoxious, the bard intended purely as tavern-dressing that the PCs are surprisingly interested in, the shopkeep they want to try to bluff for a discount, etc. There are dozens and dozens of great NPCs here, both low-level "townsfolk" and high-level threats, and all are fully fleshed out with gear and boons (from Chapter 4). In addition, there's really good advice on how to swap out a feat here or a weapon there to create different variations on the stock NPC. I've used this chapter a lot (as have many PFS scenarios). The later publication of the NPC Codex and Villain Codex makes this section slightly less crucial, but I still get a lot of use out of it. Apart from indices and an appendix (on recommend reading and films), the book ends with a miscellany of tracking sheets--a Campaign Sheet, a Settlement Sheet (something I should actually use, now that I think of it), an NPC Sheet, and a Basic Rules Cheat Sheet (that I'm going to start handing out to new players to ease their transition into the game). From the chapter summaries above, you can tell the book is just chock-full of useful advice and resources for running the game. Although essential for new GMs, even experienced ones will still find a lot here to make the book worth buying and reading. Right Next To The Core Rulebook On My Shelf! This product was amazing. I was blown away by the advice given to create a world and how to deal with several issues that have come up in recent gaming sessions. The crunchy side of the book was OK, but I really haven't had any need to pull out those rules and use them in my games. I overall really enjoyed this product, and can't wait to see what comes next! This pearl of GM manuals should be found from every already practising or aspiring-to-be GM's collection. Yes, it's that great, even for folks who don't run Pathfinder. Well written, easy to understand, beautiful to look at... not to mention a well of inspiration it also achieves to be. It's a near perfect package of knowledge how to run smooth, richer, better RPG campaign. Sure, there are chunks of system specific stuff inside, but the most important bits of knowledge of how to run your game are universal and will fit in any system and game table. For juniors, it is essential. For the vets, well, if you're already good at what you're doing, you can always be better, and perhaps you're not perfect and can learn at least one useful new trick out of it. Read the book cover to cover. Although most of it is repetition for old-time gm's I like the style, flavour and content of the book. It's pure inspiration and also a few goodies that are easily put to work: chases, hazards, haunts - now tried out with success in my current campaign. A bit to many references to the Core Rulebook annoys a bit. Honestly this book is not at all needed if you have any GM experience at all. Has some good world creation tips but otherwise feels overly simplistic. My opinion would change greatly on this book if I was new to gaming however. This is exactly the type of thing I was hoping for when it came to the "other" hardcovers for the PFRPG game. Something that is going to be a good toolbox for a GM. Yeah, despite being a DM/GM/etc... for over 25 years I think I may find this of interest as well, especially since I don't think I come anywhere near doing things as well as Paizo does them. Ah well time to sell a kidney. I wonder if this will be the art for the cover. It is the pic on the Gamemastery treasure chest. No. It is a mock-up. Wayne Reynolds is doing an original piece for the cover of this book. I'm sold on the "additional advanced rules". Yummy. I would have been happy with this cover as well. I like that pic. How big is going to be ? Who are the authors ? 320 pages; written by multiple Paizo staffers and contributors—you'll see a lot of familiar names. Holy flumph Batman, that's 40 pages more than the DMGII !!! Can't wait. And I hope that Pett and Logue will do a chapter on "How to DM for kids: Plush Mountain Massacre done easy". Its due in 2010, thats about 8 months form now, plenty of time to budget and save for it. pre-ordered, looks very interesting now can't really wait to get my hands on it. There is so much listed there that looks to be almost essential for a game, or at leat make a GM's job easier. I wonder if the converting from other systems will include a how to for 3.5 and 3.0 stuff like classes and races. I'm assuming this will be part of any PFRPG subscription. - chase rules. Yes, it's listed in product description. Chase rules. CHASE RULES !!! - some kind of quick and dirty mass combat system maybe ? - more "Ask a Pro". The series is stellar so far ! The summary page for this product is better than the entire DMG II. I can't wait to get it! By all means post topic requests to this thread, as there is still time to influence the contents of the book (I'll finish the outline in about two weeks, but even after that there will be time to squeeze things in). A lot of this stuff is definitely in the book. I know Jason is really interested in doing something with mass combat, so maybe I can press him into putting something together. I dunno about whore tables. I think to be more inclusive we'd have to include things like charming catamite and desperate addict. And I think it would piss off as many people as it would impress. Not sure. The long distance travel breakdowns... that's a VERY interesting idea. I promise there will be chase rules. The content of this book looks incredible ! If there's anything I would add, it would be a section '' how to deal with a X player ''. For example, how to deal with a new player, a hack and slash player, rule maniac player, etc. A few tips from the pro's could help me deal with the different type of player's I encounter. Maybe a few house rule suggestion for each of those type of player's. Anyway, it's just a suggestion that crossed my mind. As far as the designing a campaign world from scratch I'd like to make a recommendation to add to that section. If you haven't seen the rules for Dawn of Worlds, the free world creation game, I'd suggest taking a look. I'd love to see something presented along those lines to provide a way to help get the players involved in world creating and story sharing, easing design for the GM yet providing a fun way to do it. One thought I have is that it could be presented as a way to give epic characters more of a challenge in game, while still being stand alone rules, as they become the gods like in nature, allowing the players to help design their next campaign world with the GM. I like the idea that previously played epic or high level characters becoming the gods of the next campaign world. Something I'd like to see is a d20/Pathfinder version of the LifePath character building options seen on some Fuzion-based games (Artesia foremost). While it looks like a bunch of tables at first sight, it actually offers a great way to create colorful PCs for uninspirated gamers (or rookies), teaching in the meanwhile some basic features of the setting. ..................... I am actually a little ashamed of myself right now. May I suggest in the 'world building' section, an essay on integrating 3PP material into a homebrew? One of the things I loved about the Stargate RPG was suggestions on how to incorporate Nyambe and Seventh Sea stuff into the Stargate RPG, for example. 1. Guilds, affiliations, trade consortiums, Bardic colleges. In particular what type of groups exist in Golaria. How to create one? What benefits, and problems when you are in one? 2. Building of shops (magic, blacksmith, alchemy), or creation of trade routes. What are the costs of setting one up, maintaining? 3. Mass combat rules....YES PLEASE!! Can't wait to see what others would like to see. This is the exact sort of product I was hoping for. I think I'm more excited about this than the RPG Hardcoverf (and I'm pretty excited about that)!! I strongly second this one: being a RPG old-timer (may be not the only one out there on the boards I suspect ;-)), my gamers regularly ask me for an initiation game for some of their 7-8 years old kids (my daughter is only 2+ - she will wait a little bit more for Mr. Logue's wonderful adventures). Any recommendations (and why not a 3-4 pages scenario as a dowloadable bonus pdf ?) whould be greatly appretiated. I have read exchanges about this on the boards sometimes, but your input - O Paizo Mogols - would be most welcome! Great topic. Is there an existing thread regarding kids and RP? I run a simple campaign for my kids and their friends and they have a great time. I would love to compare notes. I'm also excited about this book, but too be honest, I don't need 100 NPC stat blocks. I think that 1) this would take away too many pages that could possibly better be used 2) there are NPC-generator outthere that can do this for you. This is not to say, that there should be no statblocks for NPCs, but perhaps cut the number in (perhaps) half. The freed-up pages could be used for stronghold-rules, UA-like rules and options, traits, or expanded envirnmental rules including rules for adventuring on different planes or something like that. Very interesting. I've been thinking about this recently. The idea of a "magic shop" seems unpalatable to me. I mean, how long could, "Encanters R US" stay open and not be raided, robbed, destroyed and or obliterated by every powerful NPC/monster in a 500 mile radius? In my mind, aside from treasure or buying a magic item from another NPC, it seems reasonable that each new magic item would have to be commissioned from a wizard/sorcerer, etc. Sorry, I am new to these forums, and probably off-topic here. Anyone know of a thread that already discusses this topic? This is not to say, that there should be no statblocks for NPCs, but perhaps cut the number in (perhaps) half. The freed-up pages could be used for stronghold-rules, UA-like rules and options, traits, or expanded envirnmental rules including rules for adventuring on different planes or something like that. How about two books? The Gamemastery Guide could be 320 WITHOUT NPC statblocks. And the second book could be 320 pages of nothing but NPC statblocks. I am a big fan of this book. :) I like NPC stat blocks, chase rules, and would throw my voice behind the movement for mass combat rules. How about additional class tradeoffs (as we've seen in the Campaign Setting)? Those are neat, and allow further customization of a class. I think this would be an opportunity to add in a lot of the great suggestions found on the boards that didn't exactly fit the final ruleset parameters as optional rules (a la Unearthed Arcana). I dunno about whore tables. But it does have "NPC favour" tables. I guess they include sexual favours, yes? And so on. We really need guidelines for that sort of thing. We have treasure tables, we should know when a kiss is appropriate, and when a hero can expect to get some play. That's one of the reasons adventurers become adventurers, after all. It's all about money, alcohol and fooling around! Is is that just me and the people I play with. I think some suggestion on improvised use on the environment would be helpful for GMs, such as collapsing a pillar onto a opponent. As an example, I had a PC knocked into the fish slurry in COTCT: Edge of Anarchy. I quickly came up with a save DC for him to avoid being sickened for one round. Likewise, a table giving skill check DCs a CR rating might be useful for setting up skill based challenges (if this has not made it into the basic rules). Ah, yes that would be something! The statblock book that is. Note that I tag npcs from role, not necessarily class. So a "binder" would be a level 11+ conjurer in a core game. That's in the outline for sure. I think we might hold off on that type of thing for a more player-focused book. I love the old "Central Casting" books, though, which I think pulled this off best. I'd like to see "Ye Old Magic Shoppe" concepts addressed. James has said that the players ability to shop and buy better gear is a basic assumption in any Paizo AP. That is, you have to let players sell magic gear and buy the stuff that they want and need. Or, tailor their treasure exactly. But usually the dreaded Magic Item Shop makes me cringe because it shatters my own suspension of disbelief, even as the GM. I deal with it as best I can. But rather complaining about it, Erik Mona, I'd love to see some insight on how to handle "shopping for magic gear" in a way that feels smart and looks good. We may end up trimming some of these if we need to. Still, mass combat, expanded environmental, stronghold building and management, chase, research, mystery and investigations rules... a big boat full of Paizo-style gaming goodness! Not that a DM needs to be given the right to deal with magic stuff in his campaign as he wishes, but reading the opinions of some respected designers (or fellow DMs) might comfort him in his ruling on that matter or moderate it somewhat. And, from a certain perspective its not a hard topic. If you want to, you can boil it all down to "are you going to let them buy stuff or not?" So yeah- you can reduce it down a yes or no question, for sure. Its just that there's a lot painstaking detail in many campaign settings, and trying to wrap my head around this image of a little old man in a shop with a handful of +1 swords.. Well, it always makes me cringe. I'm an old grognard from 1st Edition, and "the Magic Item Shoppe" is a legacy where I say that the good old days weren't always great. Are magic items for sale always salvage? Are they always custom works (and if so, shouldn't that make them inconvenient to acquire mid-adventure)? Does some mage just make Handy Haversacks to supplement his retirement? Again, it's easy to just let players buy and sell stuff without thinking about it. What I'm proposing is how you do that and make it fit in your campaign world in a cool way. That's a GameMastery topic I'd love to see a few paragraphs about. Hey I need a kidney, maybe we could work something out? Left or right? I only need a right kidney, symmetry you know! Can you put something in there about creating a sandbox-style game? And please feel free to use existing Paizo adventures to build it. I'd also like a summary chart that lists (up to the date of publication) all the Paizo adventures (modules and adventure paths) and what type they are (wilderness, dungeon crawl, city, mixed, etc.) and what levels they are for (again, for plug-and-play or one-shot purposes).